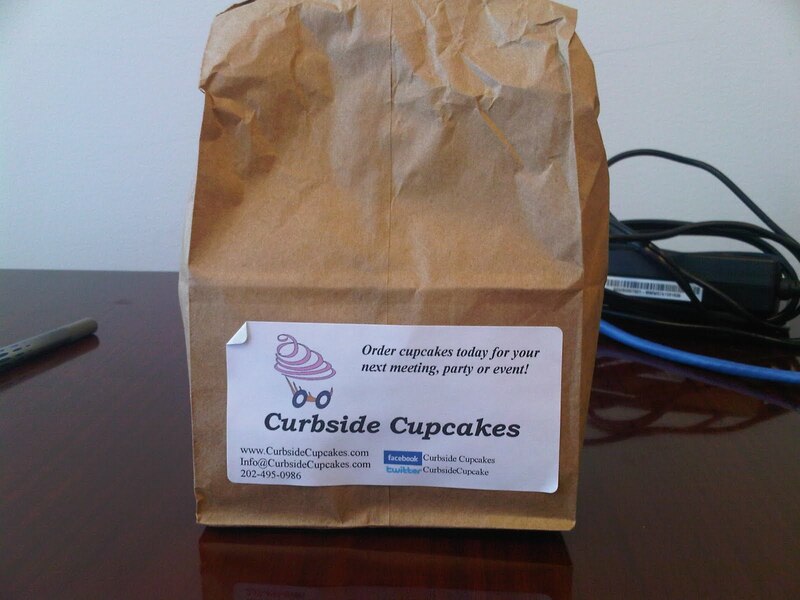 As I was saying, Washington DC has gone cupcake crazy and I kept missing the Curbside Cupcake truck. The last time I was here, someone in our office even ordered them for a meeting and I still missed them. So I flew in on Monday morning, and right when I arrived I marched over to Marsha’s office and demanded that she summon the cupcake truck. She went online and told me that it would be at our building on Tuesday afternoon. This morning, she brought over the menu, so that I would know exactly what kind of cupcakes would be there today. 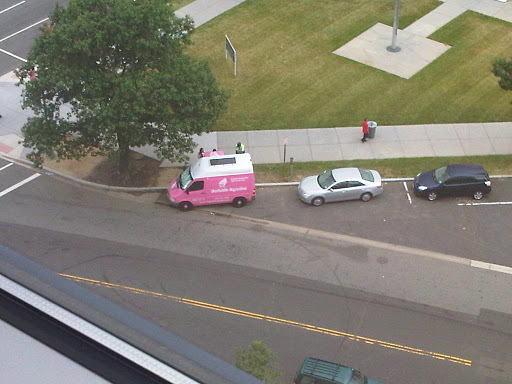 As I was leaving for lunch, she reminded me not to be pokey, because the truck would be there by the time I got back. And so it was. I could see it from my window. There were about a dozen people in line when I got there. Three bucks for a cupcake. That’s called A Trip to Starbucks, people. It came in a little lunch bag, so you have to take care not to smush your frosting. I ordered the Classic Vanilla. Normal sized cupcake with a cute swirl of frosting. It sure doesn’t look like anything spectacular. The verdict? 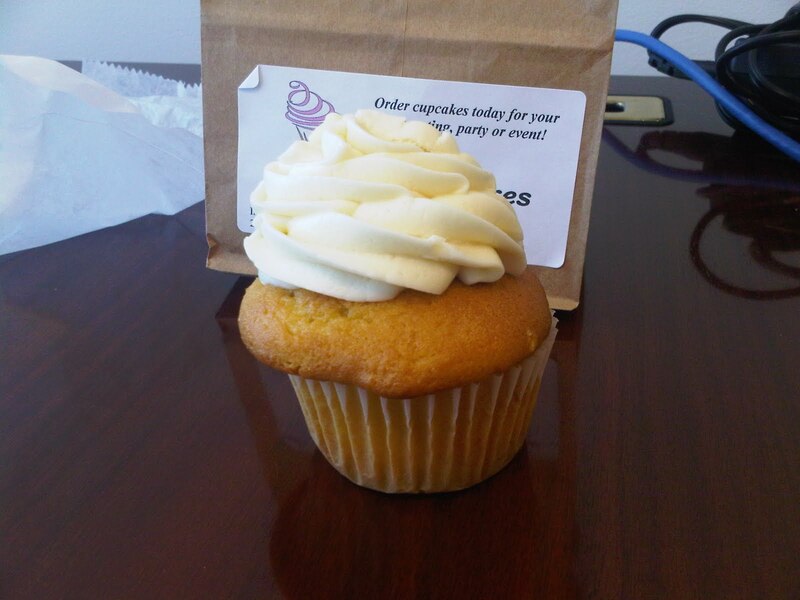 The cake was the best tasting cupcake I have ever had in my life. The frosting was…too much. It felt like eating butter. To be fair, I was a true frosting person as a child. I seem to have outgrown it. I keep forgetting that I have outgrown it. So I have a habit of eating the bottom part first, thus doubling up on the amount of frosting I am eating with the top part. A three dollar cupcake is pretty steep, but for a once a week treat, I can see it. But I am not Friending (or Liking or Following or whatever) them on Facebook. This entry was posted in reviews, Travel.